YTheyJoin is the only target marketing/segmentation program that tells you how members want to interact with your association based on their current and future needs. This is different from data mining that is based on past behavior. Our licensing agreement allows you to assign marketing codes to your members based on the following categories. Mailboxers: primarily want involvement through the mail, computer, or hand-helds. Relevant Participants: attend conventions, seminars if relevant. Shapers: most active and want to shape association policy. CompShoppers: compare the association to other organizations or info/benefits. Cognoscenti: want the association to add to their fund of knowledge. Boosters: the association improves their image. Altruistics: share the values of the association and have interest in advocacy. Doubters: tend to resist change and new initiatives. The process is very simple. Every member fills out a brief form and, based on their answers, a 3-digit code is written at the top of each form. Then the association enters the codes into its member database. The form can be a dedicated mailing, part of your member application or welcome-aboard packet, in your magazine or newsletter, on your Web site, etc. Target Shapers to serve on committees, develop chapters, recruit new members. Target Altruistics for letter-writing campaigns to legislators. Send repeated meeting announcements only to Relevant Participants. Send Mailboxers an Annual Index of your magazine articles or a Preview of next year. Design different renewal letters and provide incentives based on the nine categories. 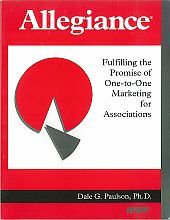 We also provide the Allegiance Workbook that has extensive marketing ideas, the YTheyJoin Pie Chart that shows which categories dominate your association, and a Summary of Implications. It is unlike data mining that is based on past behavior, is time-consuming, and has little or no info on first-year members. It is unlike mass marketing that is expensive and assumes everyone is the same. It is unlike membership surveys that go to just a small, random sample. It is unlike membership or renewal applications that are cold and impersonal. For those desiring more information about how YTheyJoin (formerly called Allegiance) was developed please see the book by Dr. Dale Paulson. It is called Allegiance: Fulfilling the Promise of One-to-One Marketing for Associations and the book is available at Amazon.com. Dale Paulson is the inventor and sole provider of YTheyJoin (formerly called Allegiance).